If you’re someone who pays attention to small details, the short, easy hike to Moorland Mosaic may be for you. 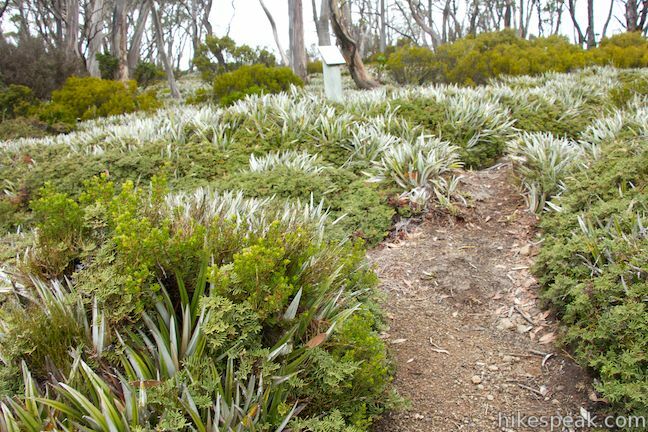 This 2/3 of a kilometer round trip hike in Mount Field National Park won’t produce the area’s grandest vistas, but it will give you a good opportunity to examine an interesting mix of vegetation in an alpine meadow. There is only 20 meters of elevation gain on this boardwalk trail, creating an easy outing that can be stretched by continuing up the trail to Lake Belcher and Lake Benton. 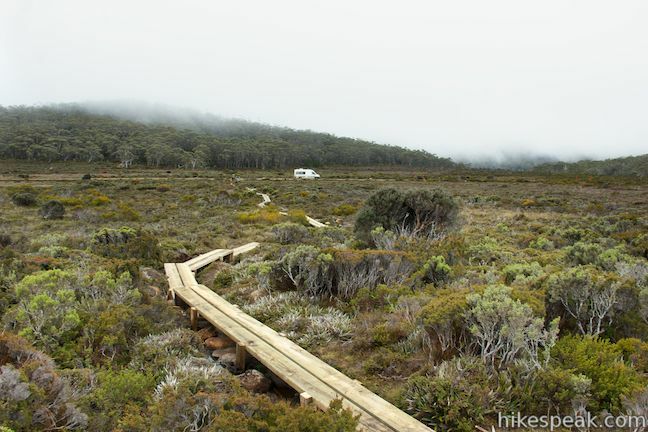 Moorland Mosaic Track starts from the left (south) side of Lake Dobson Road, a dirt road that climbs into Mount Field National Park. The trail ventures up a gradual hillside covered in grasses and low brush. 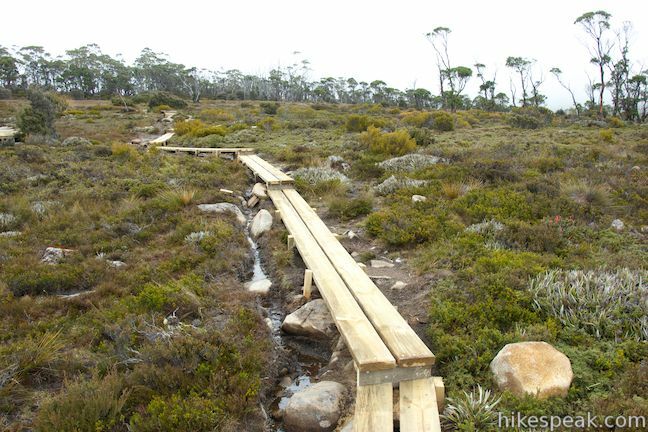 A new boardwalk has been built atop the trail to keep your feet dry across this temperamental terrain. 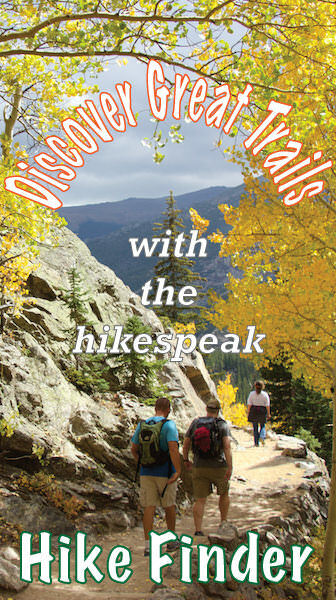 The trail is a two plank-wide walkway running up an open meadow with occasional steps. If it has rained recently, you will cross wet parts of the meadow where water pools and streams along the trail. The trail actually passes through a drinking water catchment area, so don’t do anything to contaminate the water. After 1/3 of a mile, you will approach a line of eucalyptus trees and arrive at the Moorland Mosaic. 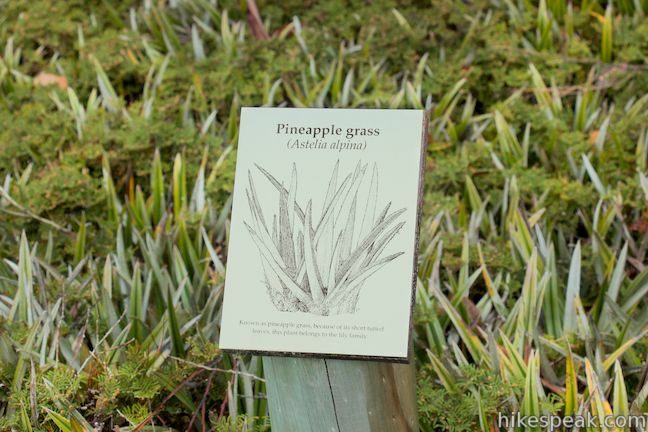 A panel on the left side of the trail points out the pineapple grass, an interesting plant with short bunched-together leaves that mix with alpine coral-fern and the other plants in this area to create the mosaic. 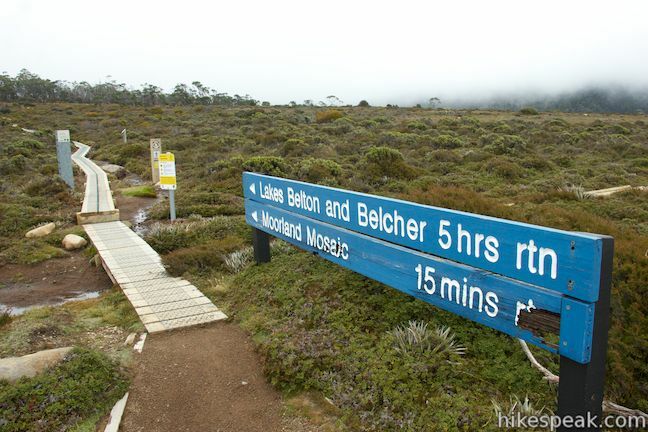 There is a sign for Lake Belcher (two hours away) along the trail that continues beyond Moorland Mosaic. 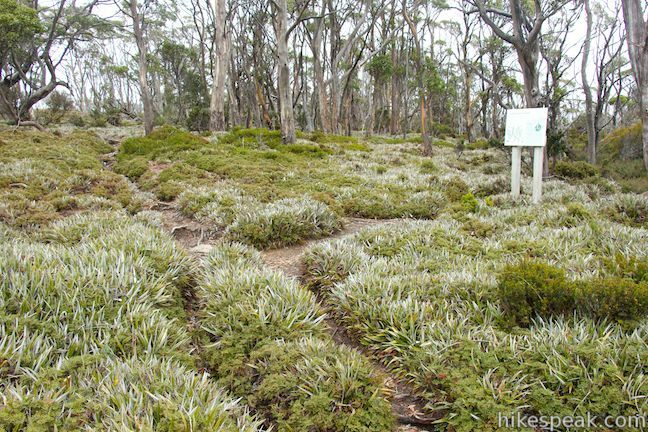 A large panel here titled “a forest near its limit” explains how this sub-alpine eucalyptus forest in an ‘inverted treeline’ created by the area’s particular landscape and weather conditions. As the road to Lake Dobson climbs higher, the increasing number of plants reaches its peak in this area. 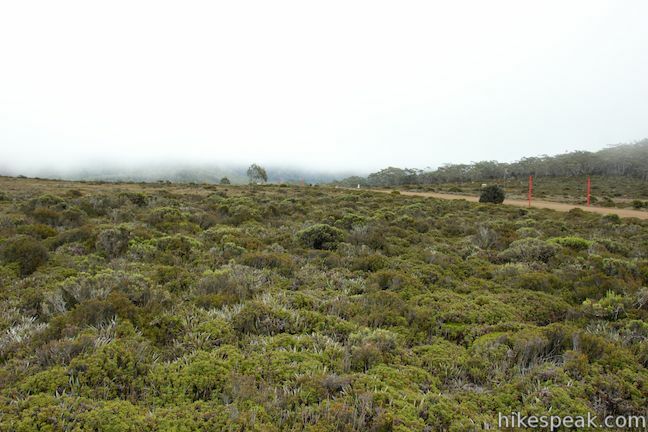 Here, at an altitude of 1,070 meters, weather conditions and poor drainage have created open moorland surrounded by sub-alpine eucalyptus forest. It may look flat and featureless-but in Wombat Moor’s patchwork quilt, more than 30 different species grow. 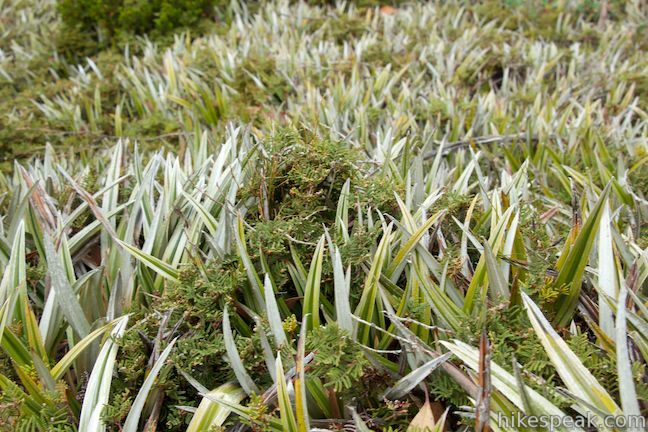 Many of them are members of the Epacridaceae family of health species that occur in abundance at this altitude. 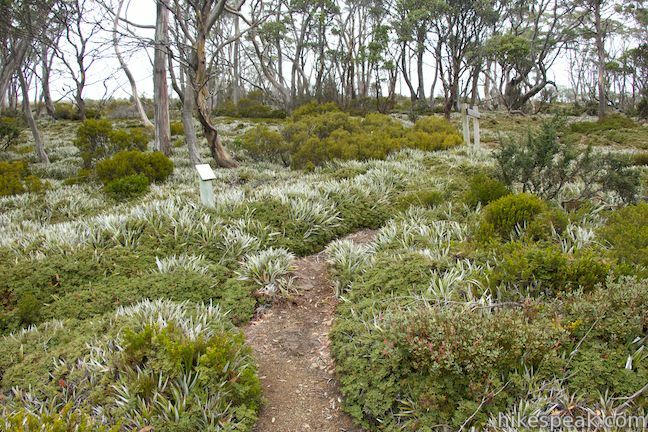 These plants have to tolerate the extremes of alpine weather conditions – bleak and cold, or hot and dry. In winter, the ground often lies beneath a mantle of snow, and icicles hang from the shrubs – in summer, fires or drought can threaten the fragile plant communities. They’ve adapted to the changing conditions in different, specialized ways. Most have very small leaves, reducing the surface area exposed to the cold. 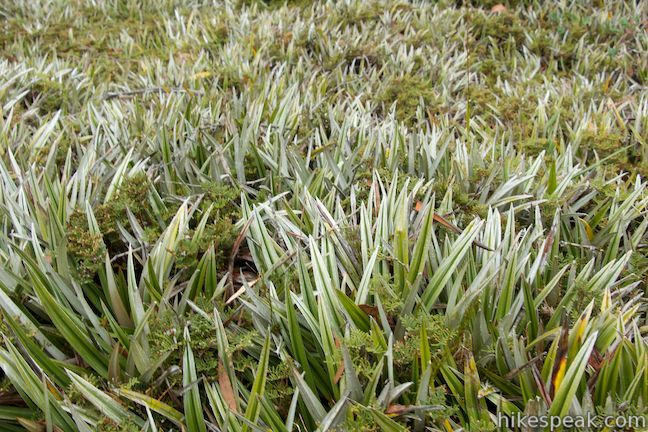 The dense tufted mats and stiff, hairy leaves of pineapple grass (Astelia alpina) protect the plant from cold winds. 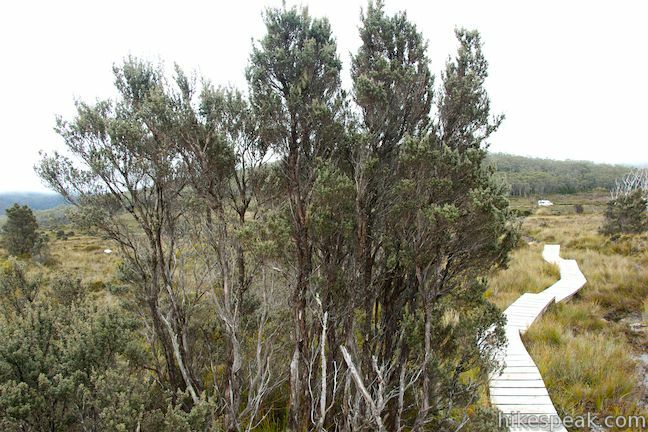 Creeping tea tree (Leptospermum rupestre) doesn’t mind wet feet – it thrives in these waterlogged acid soils. Pruned by the wind, it hugs the ground for protection. Strawberry pine (Microcachrys tetragona) grows in the ice of boulders, tucked away out of the breeze and warmed by the sun’s heat in the rock. Directions: From Hobart, take Highway 1 north to Granton and head west on Lyell Highway (A10). After 33 kilometers, turn left onto Gordon River Road (B61). Take this road for 23 kilometers and turn right onto Lake Dobson Road. After 500 meters, pass the Mount Field National Park Visitor Center by Russell Falls. The road will become unpaved as you proceed another 13 kilometers to Moorland Mosaic. The start of the trail is on the left side of the road alongside a blue sign that lists Moorland Mosaic as a 15-minute return and Lakes Belton and Belcher as a 5-hour return. 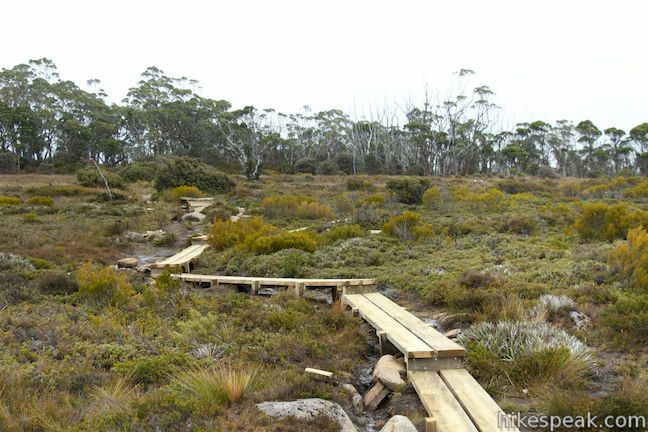 These photos were taken in April of 2014 as boardwalk was being added to this trail. 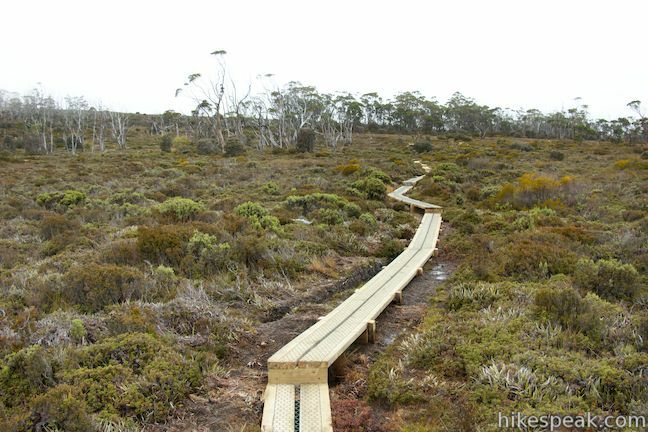 As a result, the boardwalk may extend farther than depicted when you visit the trail. 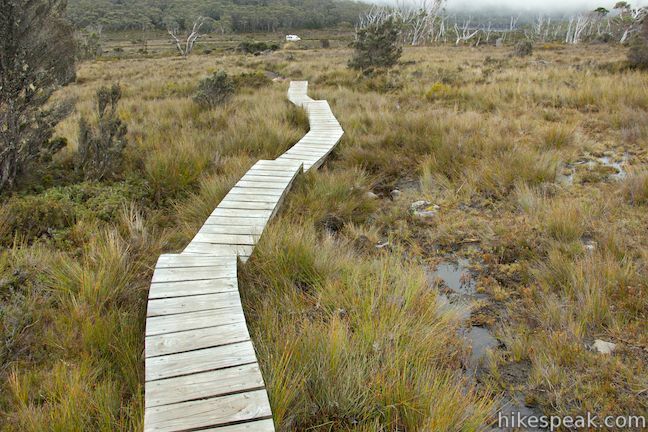 This hike in Mount Field National Park visits one of Tasmania's most famous and beautiful waterfalls and can be extended from 1.8 to 2.65 kilometers by venturing to the top of Russell Falls and nearby Horseshoe Falls. 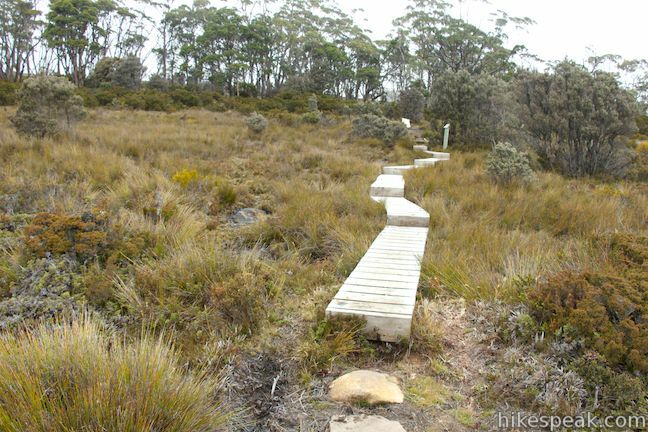 The 0.3-kilometer round trip walk on Pinnacles Boardwalk can easily be extended to a 0.75-kilometer walk on the top of Mount Wellington, checking out another short boardwalk and the trig station at the summit. This 1.1-kilometer loop in Hobart's Wellington Park reaches a unique eucalyptus tree with tentacles for roots that wrap around a boulder. This 2.2-kilometer walk passes the Upper Cascades on the Liffey River to reach the base of lovely Liffey Falls, one of Tasmania's finest waterfalls. This 3.4-kilometer loop combines Zig-Zag Track, Cataract Walk, and Bridge Walk to explore Cataract Gorge Reserve, an impressive natural area just outside the center of Launceston. 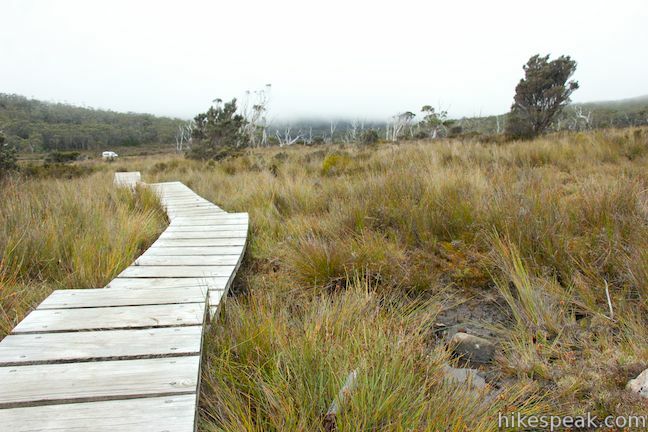 This hike explores a long, pristine beach on the east coast of Tasmania north of the Freycinet Peninsula. This 0.6-kilometer circuit provides big views along the east coast of Freycinet Peninsula, circling 100-meter tall bluffs to reach the Cape Tourville Lighthouse. This approximately 12-kilometer loop takes a rewarding route through Freycinet National Park, visiting pristine light sand beaches at Hazards Beach and the renowned Wineglass Bay. This 0.9-mile walk visits two impressive features on the coast of the Tasman Peninsula, a natural bridge and a chasm carved by the sea. This short walk in Tasman National Park reaches a coastal vista point and a wave-carved tunnel through a rocky point that has the potential to spray up like a whale spout. This 0.8-kilometer loop through the Convict Precinct explores the ruins of an old prison and coal mine that relied on convict laborers. This 12 to 14-kilometer hike explores the pristine coastline at the southwest end of the Tasman Peninsula, reaching a cape with daunting 200-meter tall cliffs dropping to swirling seas. This 1.4-kilometer loop travels through a eucalyptus forest to a popular swimming hole on the Apsley River in Douglas-Apsley National Park. This 1.2-kilometer round trip hike descends into a rainforest to the base of a powerful 90-meter tall waterfall. 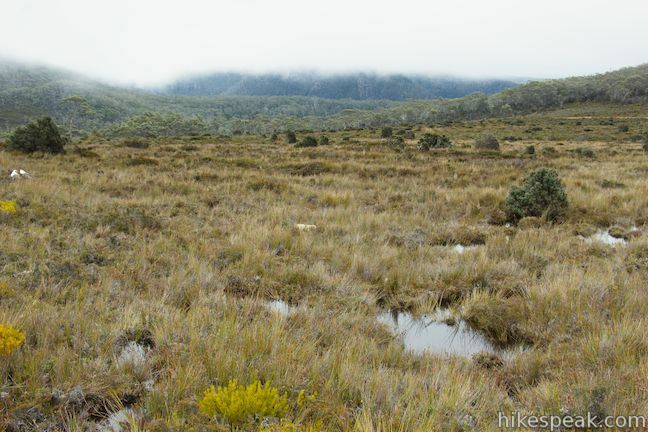 This 3.6-kilometer out and back hike tops a short summit that is the high point of Mount William National Park with panoramic views over the coastline at the northeast corner of Tasmania.